It is Universal Century 0079, at the end of the One Year War between the Earth Federation and the Principality of Zeon. 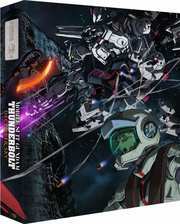 The space colonies of Side 4, or Moore, were previously destroyed by a Zeon attack, and many colonists lost their lives. Side 4 became a shoal zone filled with the wreckage of destroyed colonies and warships, lit by constant flashes of lightning due to collisions between electrified debris. It soon came to be known as the "Thunderbolt Sector." The Moore Brotherhood, an Earth Federation Forces unit made up of surviving citizens from Moore, set out to exterminate the Zeon forces in the Thunderbolt Sector in order to reclaim their homeland. To halt the Federation advance, the Zeon forces deployed their own Living Dead Division, which was established to collect combat data on soldiers with prosthetic limbs. Io Fleming, though part of the Moore Brotherhood, hates being tied down by his homeland and family history. Daryl Lorenz, having lost his legs in earlier battles, is now an ace sniper of the Living Dead Division. When they confront each other on the battlefield, they will reach a mutual realization. These two are destined to kill each other. 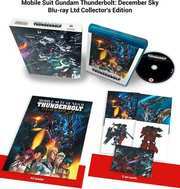 Contains the film on Blu-Ray with both the English dub and the original Japanese track with English subtitles. Presented in Collector's packaging.